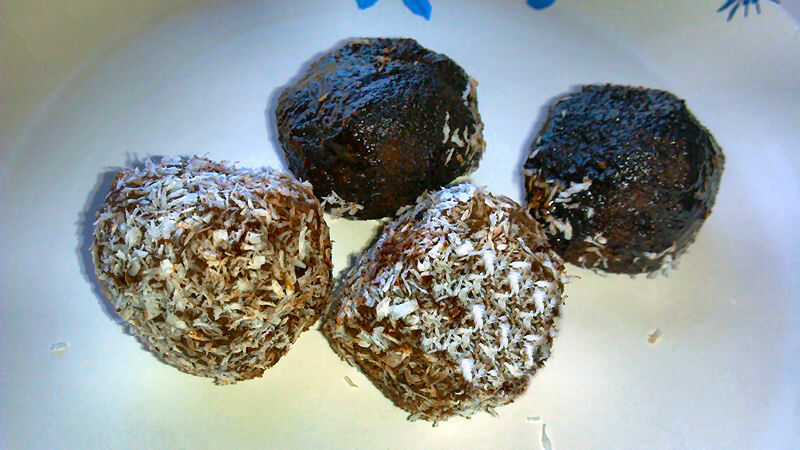 This is a delicious raw vegan recipe for coconut carob balls! They taste soooo good, are so easy to make, and have very few ingredients! Carob is a great substitution for chocolate or cacao powder, and it also has many health benefits. Carob helps to regulate the digestion process, controls blood glucose, helps to lower cholesterol, and is a great source of vitamin E, phosphor and calcium. Unlike chocolate or raw cacao powder, carob is not a stimulant as it does not contain caffeine, so it is a perfect substitution for those with high blood pressure or who are watching their caffeine intake. Carob comes from a bean, and is then ground up into powder to be used, just like chocolate. You can find carob in the baking aisle or in the health/natural foods section of your local grocery store. Now that we know a bit about carob, let us begin! 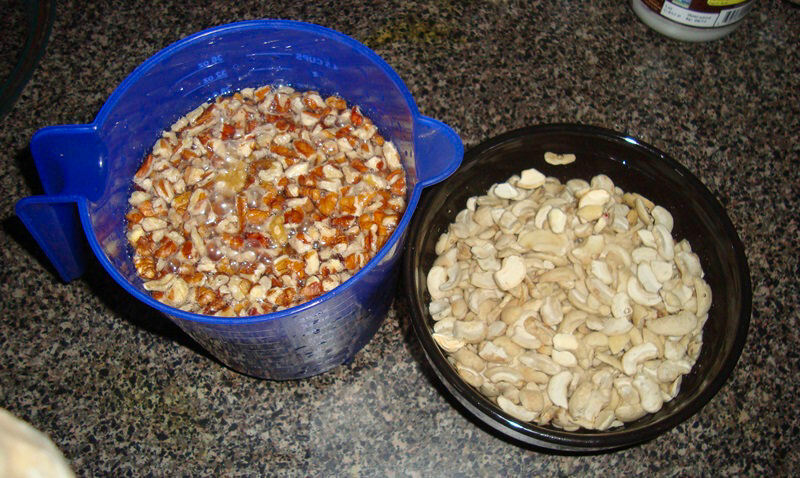 Once the nuts have been soaked, drain and rinse them, then add them to your food processor, along with the rest of the ingredients, except the dates, which should still be soaking. This mixture will be thick, so you will need to stop and start the food processor and scrape the sides in order to get the mix fully blended. Voila! Done! Now all we need to do is form the balls, and put them in the freezer to harden. 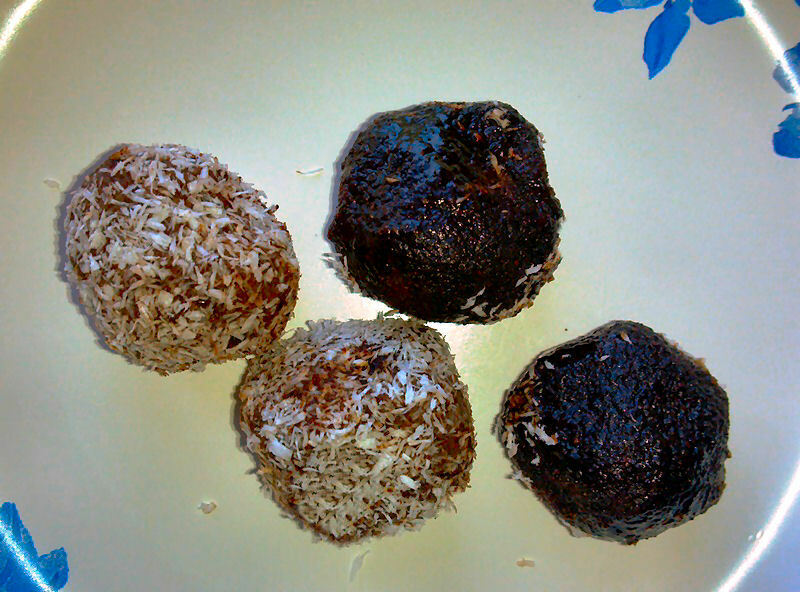 Form the balls into about 1 or 2 inch bite size pieces and then roll them in some shredded coconut and carob powder. I mixed 1 tbsp. coconut sugar with 1/2 tbsp. 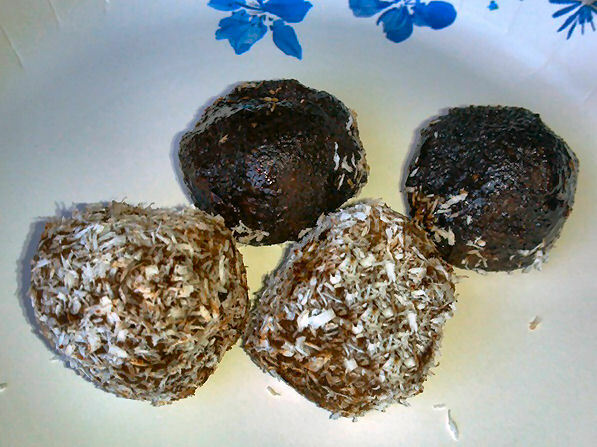 carob powder for a truffle look, as well as rolled some in shredded coconut. Once you have completed the rolling, place the balls in the freezer to harden, about 2 hours. Then, take them out and eat! They taste sooo good! This a great snack to bring to a party, or to turn people on to the wonders of raw vegan food cooking and desserts! I brought these as a dessert for Thanksgiving, and people loved them! Everyone should try them!